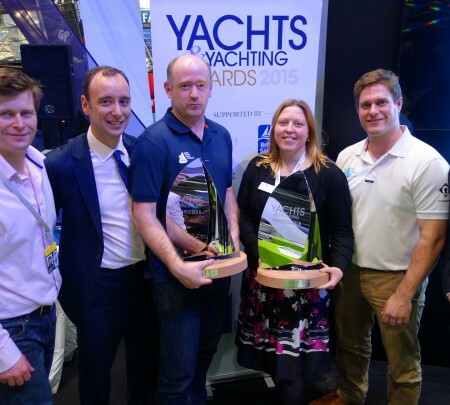 The Yachts and Yachting Awards took place on Thursday 15 January at CWM FX London Boat Show. Two of the most popular wins of the evening were the awards for Event of the Year and Achievement of the Year, won by Bart’s Bash and the Andrew Simpson Sailing Foundation respectively. These both won their respective categories by a huge margin, and their announcements were greeted by cheers from the crowds. “I think unless you have been hiding under a rock this year, you can guess the winner in this category. It was an event that blew all the others out of the water in pretty much every sense, and in doing so, Bart’s Bash set a new Guinness world record. “The numbers are astounding: 30,000 participants in 68 countries officially made the worlds largest race possible, raising over £366,000 for the Andrew Simpson Sailing Foundation in memory of Andrew ‘Bart’ Simpson.” – Georgie Corlett-Pitt. Editor – Yachts & Yachting Magazine. “The runaway winner in this category was the Andrew Simpson Sailing Foundation. And it’s hardly a surprise. The achievements of this inspirational charity in just the short time since it was set up would have made the big man, Andrew Bart Simpson, extremely proud, and have already created an exceptional legacy. I’m sure many of you here took part in Barts Bash last year, an incredible event that united sailors across the globe. It gives me goosebumps just thinking about it, it really was an incredibly experience. “But Bart’s Bash was just one small part of the vision that the Andrew Simpson Sailing has to raise funds and share their resources in order to help change the lives of young people across the country, and indeed the world, by introducing them to sailing. There’s plenty more to come I believe!” – Georgie Corlett-Pitt. Editor – Yachts & Yachting Magazine.